Earlier this evening, having failed to do grocery shopping in the normal Sunday trading opening hours, I went over to the Tesco Express near Chippenham train station. Now, I do try to avoid Tesco where I can, believing that they are too dominant in the market and as such force suppliers to give them heavily discounted prices, meaning smaller local businesses cannot compete in the race to the bottom regarding the price of food. You can read more about this here. As I crossed the car park I spotted a homeless man sat near the cash machine – a spot I have seem him in before. As I approached he muttered asking for change, and I didn’t reply, and he thanked me anyway. He was sat, his knees covered with a sleeping bag. He might of had a dog, I don’t remember. As I stocked up on a few essentials (bread, cheese) before the post pay day shop, I grabbed a cheese and onion sandwich off the shelf to give to the homeless guy – in case he was a vegetarian. This, for me anyway, got around the barrier of giving him cash (plus I had no cash on me). I queued up, paid and went outside to give the guy his sandwich. He had gone. The sandwich is now in my fridge. I have no idea what to do with it. 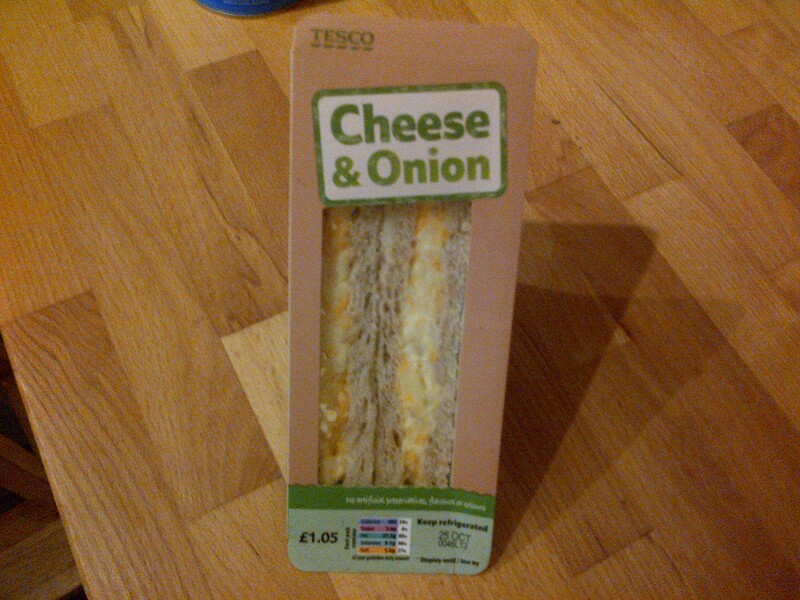 This entry was posted in Uncategorized and tagged homeless, sandwich, tesco by doobarz. Bookmark the permalink.